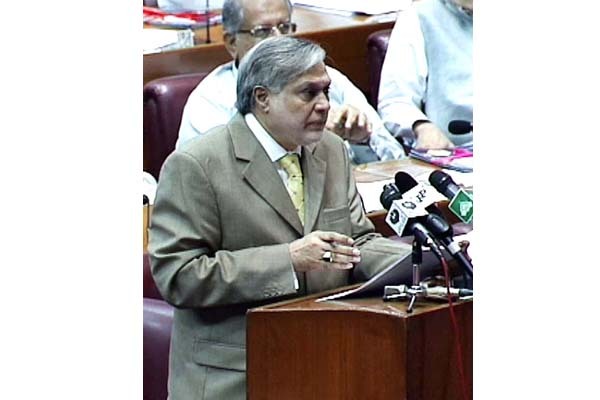 ISLAMABAD, June 14 (APP): Finance Minister, Senator Mohammad Ishaq Dar informed the National Assembly that the financial discipline maintained by the government had helped to reduce the regular supplementary demands for grants to Rs121 billion during the financial year 2016-17. The National Assembly on Wednesday gave approval to the 124 supplementary demands of grants for the year 2016-17 in addition to approving the access demands for the fiscal years 1998-99 and 2003-04. The Minister informed the house that the total supplementary budget was recorded at 1,439 billion during financial year 2012-13, which included Rs1,327 billion regular supplementary grant, adding that the regular supplementary grants have now been reduced to 121 billion in 2016-17 owing to financial discipline maintained by the government. Giving details of the supplementary grants he said that out of the total grants of 2016-17, the debt portion was Rs68 billion while Rs11.981 billion were provided for raising 57 wings of civil armed forces. The government also provided Rs 11.404 billion for fertilized and cash subsidy and Rs 4 billion for conducting Census. The NA on Wednesday gave approval to Rs37,003,000 for Cabinet Division, Rs1,587,315,000 for Cabinet Division (demand 2), Rs2,088,315,000 for Emergency Relief and Repatriation, Rs543,460,000 for other expenditure of Cabinet Division, Rs3,000 for Aviation Division, Rs450,028,000 for Airport Security Force, Rs42,100,000 for Meteorology, Rs2,477,331,000 for Capital Administration and Development Division, Rs5,000 for Establishment Division, Rs20,000 for Federal Public Services Commission, Rs2,364,000 for other expenditure of Establishment Division and Rs154,504,000 for Prime Minister’ Office. The house also approved supplementary grant of Rs18,011,000 for Board of Investment, Rs2,000 for Prime Minister’s Inspection Commission, Rs89,238,000 for Atomic Energy, Rs5,000 for Stationery and Printing, Rs683,103,000 for Climate Change Division, Rs3,002,056,000 for Commerce Division, Rs1,000 for Communications Division, Rs6,701,000 for other expenditure of Communications Division, Rs10,000,000 for Pakistan Post Office Department, Rs1,174,013,000 for Defence Division, Rs31,643,402,000 for Defence Services, Rs100,002,000 for Defence Production Division, Rs620,016,000 for Federal Education and Professional Training Division, Rs48,012,000 for Finance Division, Rs317,110,000 for Controller General of Accounts, Rs51,000 for National Savings, Rs11,000 for other expenditure of Finance Division, Rs163,305,000 for Grants-in-aid and miscellaneous adjustments between the federal and provincial governments, Rs12,254,001,000 for Subsidies and miscellaneous expenditure, Rs2,008,000,000 for Higher Education Commission, Rs14,497,088,000 for Economic Affairs Division, Rs4,000 for Privatization Division, Rs14,000 for Revenue Division, Rs426,981,000 for Federal Board of Revenue, Rs490,655,000 for Customs, Rs296,720,000 for Inland Revenue, Rs18,500,047,000 for Statistics Division, Rs454,514,000 for Foreign Affairs Division, Rs109,767,000 for Foreign Affairs, Rs739,607,000 for other expenditure of Foreign Affairs Division, Rs5,966,000 for Housing and Works Division, Rs194,445,000 for Civil Works, Rs 14000 for Estate Offices, Rs 1000 for Federal Lodges, Rs432,022,000 for Human Rights division, Rs3,801,000 for Industries and Production Division, Rs1,000 for Department of Investment Promotion and Supplies, Rs96,059,000 for other expenditure of Industries and Production Division and Rs17,413,000 for Information and Broadcasting Division. An amount of Rs 25,700,000 has been approved for Directorate of Publications Newsreels and Documentaries, Rs2,133,099,000 for Press Information Department, Rs1,000 for Information Services Abroad, Rs34,970,000 for other expenditure of Information and Broadcasting Division, Rs645,622,000 for National History and literary Heritage Division, Rs144,741,000 for Information Technology and Telecommunication Division, Rs525,276,000 for Inter-Provincial Coordination Division, Rs120,901,000 for Interior Division, Rs667,466,000 for Islamabad, Rs311,230,000 for Passport Organization, Rs19,117,374,000 for Civil Armed Forces, Rs33,701,000 for Frontier Constabulary, Rs2,715,733,000 for Pakistan Rangers, Rs4,129,911,000 for other expenditure of Interior Division, Rs203,954,000 for Narcotics Control Division, Rs40,000,000 for Kashmir Affairs and Gilgit Baltistan Division, Rs2,000 for Law and Justice Division, Rs385,000 for other expenditure of Law and Justice Division, Rs9,403,000 for Council of Ideology, Rs8,000 for District Judiciary Islamabad Capital Territory, Rs260,318,000 for National Accountability Bureau, Rs90,016,000 for Senate, Rs25,355,965,000, for National Food Security and Research Division, Rs1,033,577,000 for National Health Services, Regulations and Coordination, Rs22,000 for Overseas Pakistanis and Human Resource Development Division and Rs4,000 for Parliamentary Affairs Division. The supplementary demands approve by the house also included Rs4,000 for Petroleum and Natural Resources Division, Rs18,000 for Geological Survey, Rs7,378,000 for Planning, Development and Reform Division, Rs120,000,000 for Ports and Shipping Division, Rs57,786,000 for Religious Affairs and Inter-Faith Harmony Division, Rs22,341,000 for other expenditure of Religious Affairs and Inter-Faith Harmony Division, Rs10,601,000 for Science and Technology, Rs435,003,000 for other expenditure of Science and Technology Division, Rs17,964,000 for States and Frontier Regions Division, Rs22,000 for Frontier Regions, Rs4,000 for Afghan Refugees, Rs47,102,000 fro Textile Industry Division, Rs786,539,000 for Water and Power Division, Rs439,775,000 for federal miscellaneous investments, Rs329,673,000 for other loans and advances by the federal government, Rs23,100,001,000 for development expenditure of Cabinet Division, Rs351,238,000 for Development Expenditure of Aviation Division, Rs1,000,012,000 for development expenditure of Capital Administration and Development Division, Rs1,000 for development expenditure of Climate Change Division, Rs1,000 for development expenditure of Commerce Division, Rs64,750,000 for development expenditure of Communication Division, Rs2,159,174,000 for development expenditure of Federal Education and Professional Division, Rs570,440,000 for development expenditure of Finance Division, 1,531,328,000 for other development expenditure, Rs426,806,000 for development expenditure outside public sector development Programme, Rs2,239,824,000 for development expenditure Economic Affairs Division outside PSDP, Rs4,000 for development expenditure of Revenue Division, Rs1,283,000 for development expenditure of Human Rights Division, Rs5,000 for development expenditure of Information Technology and Telecommunication Division, Rs3,732,401,000 for development expenditure of Inter-Provincial Coordination Division, Rs152,140,000 for development expenditure of Interior Division, Rs156,668,000 for development expenditure of Narcotics Control Division, Rs100,001,000 for development expenditure of Kashmir Affairs and Gilgit Baltistan Division, Rs2,000 for development expenditure of Law and Justice Division, Rs55,797,000 for development expenditure of National Food Security and Research Division. An amount of Rs5,197,206,000 has been approved for development expenditure of National Health Services, Regulations and Coordination Division, Rs 450,393,000 for development expenditure of Planning, Development and Reform Division, Rs10,000 for development expenditure of Science and Technology Division, Rs11,817,250,000 for development expenditure of Federally Administered Tribal Areas, Rs8,364,000,000 fro development expenditure of FATA outside PSDP, Rs6,605,989,000 for development expenditure Safron Divison outside PSDP, Rs1,788,442,000 for development expenditure of Water and Power Division, Rs1,195,000,000 for capital outlay on development of Atomic Energy, Rs1,100,000,000 for development loans and advances by the federal government, Rs6,565,538,000 for capital outlay on civil works, Rs1,000 for capital outlay on industrial development, Rs7,524,810,000 for capital outlay on Petroleum and Natural Resources. The House gave approval on charged excess demands for grants and appropriations of Rs 18.122 billion for the year 1998-1999 and Rs 6.166 billion for the year 2003-2004. The House also approved excess demands for grants for the year 1998-1999, the House approved Rs 13,748,870 for Cabinet Division, Rs499,804,413 for Emergency Relief and Repatriation, Rs31,043 for Prime Minister’s Inspection Commission, Rs28,679,673 for other expenditure of Communication Division, Rs7,640 for Pakistan Post Office Department, Rs3,026,751 for Finance Division, Rs15,913,973 for National Savings, Rs475,375,105 for grants-in-aid and miscellaneous adjustments between the Federal and Provincial Governments, Rs23,396,150 for Civil Works, Rs9,823,532 for Estate Offices, Rs22,807,118 for Information Services Board, Rs1,142,584 for Interior Division, Rs1,300,611 for Islamabad, Rs10,434,722 for Civil Armed Forces, Rs12,517,410 for other expenditure of Interior Division, Rs 43,286,513 for Federally Administered Tribal Areas, Rs29,867,513 for other expenditure of Kashmir Affairs and Northern Areas and States and Frontier Regions Division, Rs19,059,070 for other expenditures of Law, Justice and Human Rights Division. The House also approved Rs633,709,809 for Pakistan Railways, Rs936,161,394 for development expenditure of Finance Division, Rs3,741,000 for development expenditures of Economic Affairs Division, Rs69,316,218 for development expenditure of Narcotics Control Division, Rs 57,893,448 for development expenditure of Labour, Manpower and Overseas Pakistanis Division, Rs41,887,234 for capital outlay of Communication Works, Rs31,183,000 for capital outlay on development of Tribal Areas, Rs1,326,186,123 for capital outlay of Pakistan Railways and Rs39,417,707 for capital outlay of Irrigation and Electricity. Similarly, for the year 2003-2004 the House approved excess demands for grants Rs2,191,047 for Federal Public Service Commission, Rs4,890,571 for National Accountability Bureau, Rs229,226 for Meterology, Rs13,791,821 for Federal Government Educational Institutions in Cantonments and Garrison, Rs274,892,036 for Defence Services, Rs141,499,545 for Education, 44,266,395 for Federal Government Educational Institutions in the Capital and Federal Areas, Rs231,066,912 other expenditure of Finance Division, Rs2,433,523 for Revenue Division, Rs114,400,498 for Lands and Central Excise, Rs 75,377,313 for Sales Tax, Rs52,296,729 for taxes on Income and Corporation, Rs1,823,608 for Health Division, 12,682,871 for Press Information Department, Rs74,999,000 for other expenditure of Information and Broadcasting Division, Rs 65,409,859 for Islamabad. Besides Rs 234,805,349 were approved for Civil Armed Forces, Rs92,045,451 for Pakistan Rangers, Rs 1,326,333,378 for other expenditure of Interior Division, Rs21,482,725 for Kashmir Affairs and Northern Areas and States and Frontier Regions Division, Rs1,77,038,783 for Frontier Regions, Rs201,350,769 for Northern Areas, Rs61,557,919 for other expenditure of Petroleum and Natural Resources Division, Rs 5,807,315 for Water and Power Division, Rs676,246 for Women Development, Social Welfare and Special Education Division, Rs23,708,007 for development expenditure of Revenue Division, Rs272,634 for development expenditure of Revenue Division, Rs226,414,735 for development expenditure of Food, Agricultural and Livestock Division, Rs296,303,859 for development expenditure of Kashmir Affairs and Northern Areas and States and Frontier Regions Division, Rs447,176,324 for Development of Federally Administered Tribal Areas, Rs805,210,000 for development expenditure of Petroleum and Natural Resources and Rs 2,722,800,000 for capital outlay on development of Atomic Energy.